Is attending a networking event only marginally less painful than having oral surgery? Does walking into a business gathering feel like you are walking into your first junior high school dance? Do you worry that showing up for that business association lunch will be a complete waste of time? For most entrepreneurs, networking and word of mouth do more than just contribute to the health of their bottom line. Without those long-term professional relationships, every goal and dream for their businesses is harder or even impossible to achieve. So why are those same entrepreneurs so reluctant to attend a networking event — the start of many powerful and profitable connections? Is it their mindset? Do they lack the techniques? Maybe they just need a system or two to get them pointed in the right direction. • Learn how to get out of your own way by fighting the five Negative Networking Attitudes. • Improve your potential profit by selecting the right events and groups. 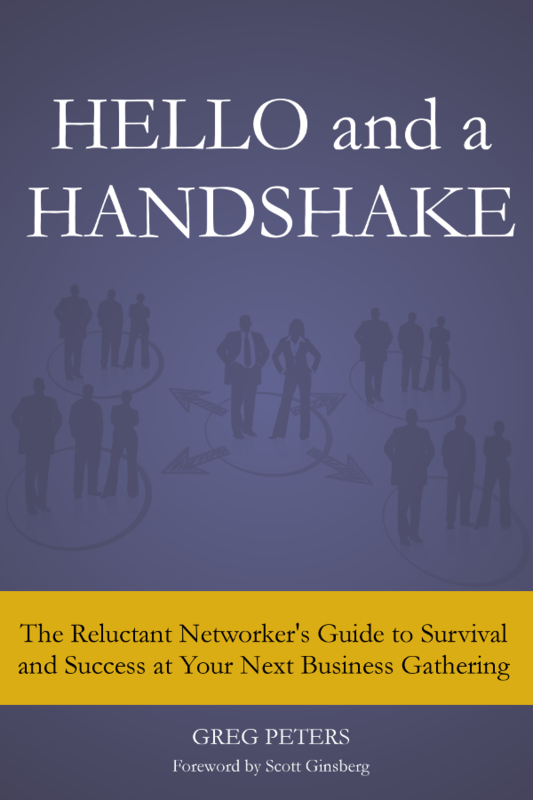 • Create a networking toolkit that will have you walking through the door with confidence. • Position yourself to start connections with one easy technique. • Become more efficient and effective by following the timeline for attending the event. • Learn to maximize your networking time during special networking activities and games. • Avoid wasting your time and money in conversational pitfalls. • Leave them wanting more (or just leave them) by breaking off the conversation gracefully. Start looking forward to success at your next business gathering. It all starts with a hello and a handshake. Note: If you would like your copy autographed, please enter the names and any specific message you would like to include in the “Order Notes” field on the Checkout screen. GREG PETERS started his professional life as a computer programmer with all the social skills that implies. He was the original reluctant networker. No matter how bad a networker you think you might be, he was much, much worse. The good news is that if a networking nerd like him can learn these techniques and tactics and be successful with them, then so can you.